Hello there, this is my first post . I have in mind a couple of projects for the future that involve snipers from World War Two and the Korean War. 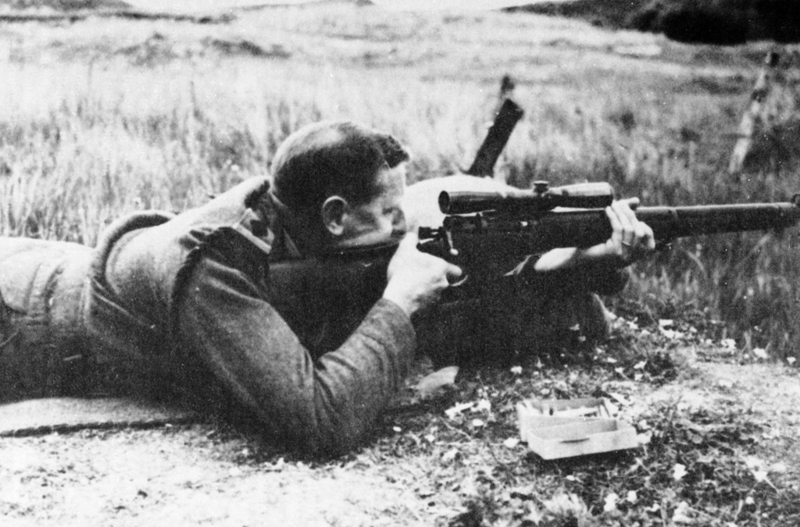 Currently, I'm keen on Canadian snipers of those wars, and I found fascinating they got, perhaps, the best equipment a sniper could have (aside from the Finns and their SAKOs, which also were superb shooting tools). I recently had the chance to ask some questions to Colin MacGregor Stevens, and the information I got from him was of great help and of my total interest for my projects . However, there were some points he couldn't explain to me, most likely because not much light was thrown over them after those conflicts. I know, for example, that R.E.L. (Research Enterprises Limited), developed the T.O.S. "C" Mk.I 25× single-draw telescope, in limited quantities (only 500, but it seems there were more). I also know that R.E.L. developed a variable power telescope of 10-20-30-40×, only in very small numbers, but the only source I heard this from, was Clive Law's Without Warning, and on this post: https://www.milsurps.com/showthread.php?t=18498&page=1 (it is a bit confusing since it lists of each when referring to this model, implying there were four, each for each power, which, to me at least, would be ilogical, since I don't find necessary they developed a lesser power telescope and another which already was the same power of the British Telescope Scout Regiment MK. IIs ). Another not-so-clear matter was that of R.E.L. 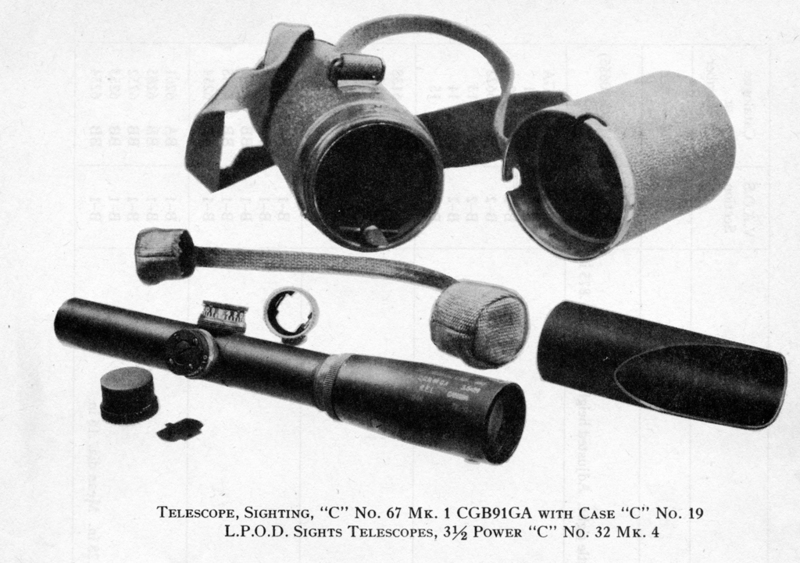 's 20×72 experimental binoculars. Apparently, only 6 prototypes were made before the end of World War Two, and I don't know if further research was carried on. I must admit such a power for a pair of binoculars (I assume for sniping, artillery, but not naval duties) for that time leaves me impressed, and I wonder why not much is heard of them (I know binoculars of the same power and lens, but they're modern! ). If they were used in the Korean War (only if production or further testing went ahead) is unbeknownst to me, and if someone could tell us more about them, or at least list a source, I'd be grateful. Courtesy for both images to Colin MacGregor Stevens (www.captainstevens.com www.captainstevens.com). If someone could provide some information about these sunshades, be sure a doubt perhaps many have had, will be clear. Finally, I wanna ask for information about the R.E.L. 5×. Little is known about it, and perhaps it is most known because it was declined by the British bureaucrats because it was too powerful (You get it right away). Jokes aside, if this scope wasn't still on developmentby the Canadians at the end of World War Two, a great chance was missed... Or perhaps not, and it went into limited production and porbably did see action on the Korean War (any information about this scope will be highly appreciated). Oh, and one missed part was if R.E.L. developed more periscopes for sniper/infantry use aside from the N°25 Mk.I (I'm there were more, but I need your help), and if R.E.L. did some experimenting with new reticles (taper post with crosswire seems to be the sole used). That would be it, hope to read your replies . And by the way.. Sorry my English, perhaps it may sound a bit forced/unnatural, and that's because I'm not a native English speaker (I've been learning it since I was a kid though ). Last edited by Hideyoshi; 06-02-2018 at 05:59 PM. If you don't have a copy of "Without Warning" by Clive Law, you should pick one up. I doubt the sunshade for the C67 was of any material but rubber, perhaps with some fibre stiffening. Anything else would potentially impact the shooter's brow. The story of REL is a microcosm of Canadian industrial history in my opinion: it was a company built from an empty lot in 1940 to over 7500 employees by 1945 and then promptly shut down and "disappeared" not long after. Canada 's assigned role in the world of geopolitics is to be a supplier of raw materials and a market for first British and later American goods. As well as a supplier of human "raw material" to the U.K. if that could be arranged. Thanks to the weakness of our political leadership in WWII, that effort was largely successful, in contrast to WWI where our leaders, despite being in some ways closer to the UK or appearing to be, actually carved a much more independent role for us than our ostensibly "Canadian" government of WWII. This correlated of course with the geopolitical goal of minimizing the growth of Canadian economic and political independence and "national sense", which happened to suit both British and American plans. The growth in those phenomena that resulted from Canada's successes in WWI was not something either "great power" wished to encourage. A short-sighted betrayal on the part of the U.K. leadership as soon enough they found themselves being squeezed in the same vise, as the USA leveraged its financial hold over them after 1945 to pick their intellectual pockets and undermine their industries and exports, the aircraft industry first and foremost. But we digress: R.E.L. built a great range of optical, electronic and mechanical equipment, and built it very well indeed as well as doing a good deal of original research. As a "Crown Corporation" they obviously saw their role, whether officially assigned to them or not, as more than just producing from whatever drawings were passed to them by the bureaucrats, but innovating improvements where they could. What mechanisms existed for soliciting and receiving user feedback I don't know, but some no doubt did. A private contractor would be likely to introduce only changes that were financially beneficial to them, unless of course they happened to "care" enough to attempt improvements that would benefit the equipment users, or hoped to profit in future from any such innovations. Law documented the games played to keep the REL/SAL innovations out of consideration for U.K. service. Not even a Monte Carlo stock for the No4(T) could be accepted without intolerable loss of face apparently, despite the user enthusiasm for them in the 1944 trials held in the U.K. And so British snipers were stuck with that misplaced cheekrest and the Victorian observing telescopes right to the bitter end. ...abandon all work on the new weapon altogether. Goodeve's visitor said bluntly that he wanted a clear field for the development of one of the competing anti-submarine weapons. The future of his own establishment depended on getting their own anti-submarine weapon into service, whereas Goodeve had no need to enhance his own reputation. Clearly, added his caller, the only honourable course was D.M.W.D. was to cease all work on the Hedgehog forwith. Goodeve was flabbergasted. This astonishing request completely ignored the needs of the Navy..."
Plenty of other examples in that book of the bureaucratic and "military mind" at work I might add! Again and again weapons systems that later became famous and highly successful had to struggle to overcome official apathy, lack of vision or such bureaucratic obstructionism, the "bouncing bomb" among them. Last edited by Surpmil; 06-04-2018 at 01:54 AM. Thanks for replying Surpmil. That's, in fact, the next book on my wishlist (I bought a copy of Sam Sloppy's Sniper Section from Colin MacGregor Stevens about two weeks ago, and I'm eager to read it as soon as it arrives at my door). I just need to wait a little more to buy it, since I have other priorities with money. You seem to be quite right about the sunshade being made of stiffened rubber, and that's something I thought of lately (these sunshades also give the scope a higher lenght, and that mislead me to think they were other scopes, not the N°67). Perhaps the image I attached which shows the scope and its sunshade, depicts a stiffened rubber one, rather than a plastic, unless it's one designed for the front part of the scope, I don't certainly know for sure. I get what you say, and I also thought that Canada, which had some superb military equipment (I cannot say very much about politics or economics since I don't focus on those aspects, but I should do so in the future), always seemed having their efforts and feats, minimized, to put it midly (One instantly thinks of the Arrow). I do have a vague idea of Americans applying the same to the Britons, for example, when Britain had all what it takes to produce nuclear warheads and even ICBMs, yet, for unclear reasons (for me at least), decided to purchase American-made SLBMs and warheads (and as for today, to my knowledge, Britain had lost all its nuclear stockpile). Perhaps the reason of being a crown corporation is what hindered their materialization of their research, contrary to a private bussiness (we don't forget about the UK's unwilling to adopt these Canadian developments). What it isn't clear for me, is why Canada couldn't keep their technology alive, via other companies, as the crown corporationa shut close little after the war. aw documented the games played to keep the REL/SAL innovations out of consideration for U.K. service. Not even a Monte Carlo stock for the No4(T) could be accepted without intolerable loss of face apparently, despite the user enthusiasm for them in the 1944 trials held in the U.K. And so British snipers were stuck with that misplaced cheekrest and the Victorian observing telescopes right to the bitter end. And to think they kept using it until the 90s, and perhaps the same happened with experimental binoculars (the games to keep them out of consideration). A very interesting example you mention there. I will look up for that book perhaps soon. The crown corporations were I think more interested in innovation that private contractors would have been. They operated on a cost-recovery basis and saw product improvement as part of their mandate - probably it was officially as well. I think it is fair to say that we have, or had in this country a happy combination of many of the best characteristics of the British and American peoples. The promise was great, but the vision was not there in wide enough numbers. Too many of those who might have been builders of this country were seduced by philosophical delusions, and the realities of power were there to pick off many of the others. The perpetual need to flatter and humour Quebec and her sixty seats in parliament also ham-strung this country. Longer story than we have space for here! As for others, great powers reflect in their behaviours the characters of their peoples, just as other nations do, and sadly usually not the best of their peoples either. The defence industries that were created during the war were referred to at times as "the fourth armed service", but with peacetime comes the usual pettifogging politics, apathy, factionalism etc. etc. Quebec continues in one form or another to chip away at the identity of English-speaking Canada , ably assisted by a post-war "intellectual elite" who swallowed cultural marxism whole and who when not wringing their little pink hands over the evils of "nationalism", whinge about how they don't want to be Americans; apparently unable to see that they will have one or the other, and sooner than they think. Last edited by Surpmil; 06-07-2018 at 11:06 PM.